Learn five simple ways to maximize your Resource Boards, News, Community Groups, Official Notes, and Schedule. This session is designed for schools that want to take the next steps beyond initial implementation tools. Get ready for UC19 in Washington, D.C. with advice from experienced conference attendees and D.C. residents. 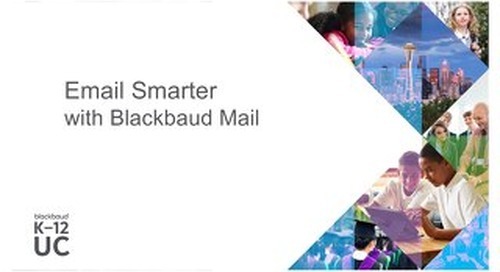 Learn how to give access to parent volunteers in Blackbaud Raiser's Edge NXT. 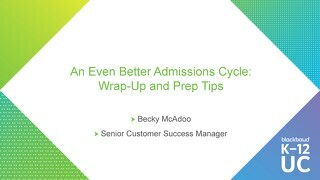 Geared toward users with at least one admissions cycle behind them, this session will cover onBoard year-end best practices and suggestions for how to get even more out of the software for next cycle. 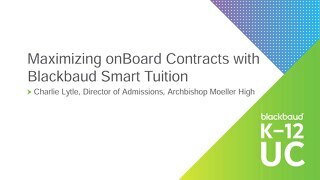 Learn how Archbishop Moeller High School improved its parent experience and school productivity by offering contracts through onBoard and Blackbaud Smart Tuition. Learn tips and tricks to take fundraising to the next level by focusing your efforts and appealing to more potential donors in different ways. 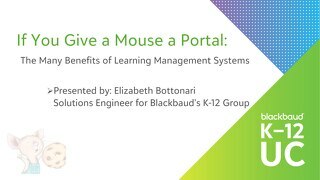 Learn more about the many benefits of Blackbaud's Learning Management System. 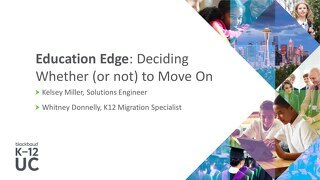 After several years of development and countless enhancements, the time may be right for your school to consider a transition to the "ON" Products. When it comes to digital marketing, how do you know which solutions your school should use? 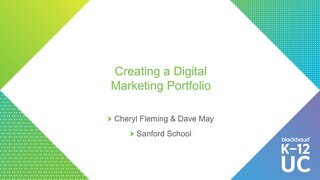 Learn how Sanford School diversified its digital portfolio with the help of SEO, MozLo, Niche, and more! 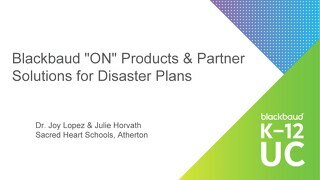 Learn how to incorporate Blackbaud "ON" Products and partner solutions in disaster response planning. Learn how to incorporate your school management platform in your in-service days, communications plans, and back-to-school events. Learn more about the best practices and practical takeaways for completing a project, increasing adoption and value among users, and what happens after the "go-live." 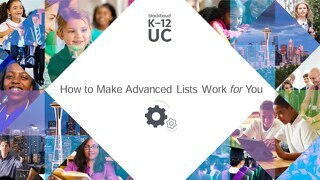 Learn more about Advanced Lists, as well as how to create and manipulate a duplicable List from scratch that will be easy to use for Pushpages and data extraction. Learn more about query objects and how to locate them in tables, use inner and outer joins, select output, and manage template access in Blackbaud's "On" Products. 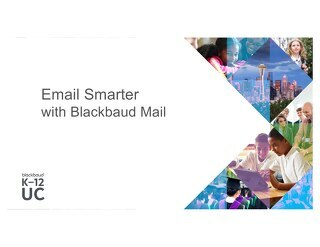 Check out these best practices for creating templates, managing distribution lists, and targeting the right audience with Blackbaud Mail. 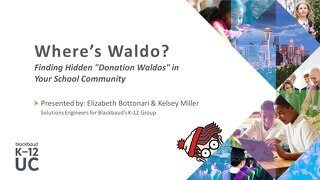 Learn how Blackbaud Target Analytics can be used to identify hidden "donation Waldos" within your school community, so you can better cultivate donors for events and other opportunities. In this session, Blackbaud Raiser's Edge NXT users and database managers will learn to create action tracks in database view so that actions appear automatically! 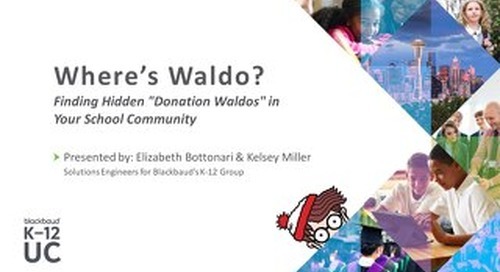 Learn how the fully connected Miami Country Day School borrowed a common higher education model to align personnel responsible for managing its databases. 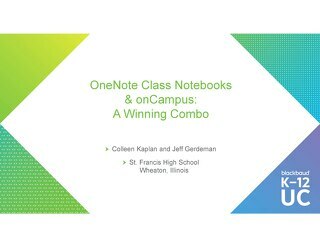 Learn how OneNote Class Notebook and onCampus work together to create a streamlined, paper-free class environment for students, parents, teachers, and administration.